Napoleon Bonaparte is one of the most complex figures in world history. Viewed by some as a tyrant and others as a hero, historians still struggle with the correct historiographic interpretation of the French Emperor. 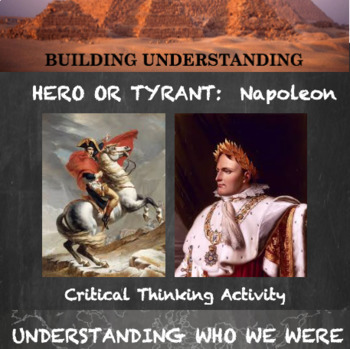 This activity encourages students to read, sort, discuss, and defend various historical facts in an attempt to help them develop a fact-based interpretation of Napoleon for themselves. This activity is perfect for leading into a Socratic Seminar (rubric included), Debate (not included) or argumentative essay (not included). 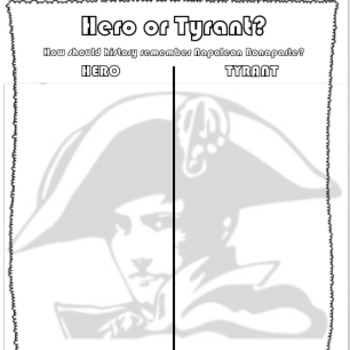 Help your students think like historians with this simple activity. Lesson instructions are included with this download in order for you to guide the classroom activity. •	You have purchased a license to use this product in your classroom only. You may not distribute this product to anyone other than your classroom students without the author’s consent. Additional licenses are available at a discounted rate. •	You may not post this product on any teacher or school website unless it is password-protected, and only you and your students have access to the password. An unprotected website will allow others to download this product without a license. Posting this product on an unprotected website violates the licensing conditions of this product. •	Please go to your My Purchases page (you may need to login). Beside each purchase you'll see a Provide Feedback button. Simply click it and you will be taken to a page where you can give a quick rating and leave a short comment for the product. Each time you give feedback, TPT gives you feedback credits that you use to lower the cost of your future purchases. I also value your feedback, it helps me develop other products you are interested in. •	If you become a follower of my store, you’ll receive updates about new products that I add to my store.